Cycling is a fun and adventurous way to stay active and keep healthy, but as with any sport or activity it comes with some associated risks and dangers. Thankfully, there is plenty of safety equipment developed specifically to protect you while you are enjoying cycling and riding on roadways. You will want to familiarise yourself with the safety equipment, how it is best used, and when each item would be appropriate to use. 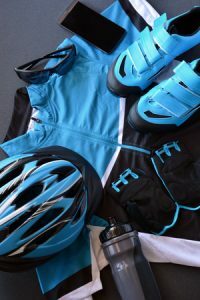 This article is intended to help you make decisions about what type of safety equipment are right for you and the style of cycling you want to do. Of course, the most important piece of cycling safety equipment is the helmet which helps protect you from any potential head injury. Helmets are designed to protect your head from injuries and concussions, which can occur even in minor accidents involving bicycles. Since you constantly need to make decisions regarding your safety while cycling, it is important to keep your brain protected and able to make decisions during future rides. There are many styles and types of helmets available, so make sure you choose one that will suit your needs best. There is other personal gear, beyond helmets, to help protect your body while cycling. The other types of safety equipment available includes gloves, mouth guards, and reinforced clothing or body Armour. Since falls while cycling can occur at higher speeds, the potential for road rash or large lacerations to the hands and other exposed skin. Using protective clothing can help reduce the amount of damage to your body should an accident occur, thus keeping you safer in the event of a fall. Protective clothing can serve a secondary purpose and also be made of a bright or reflective material which can improve your visibility. Reflectors and lights are helpful in alerting traffic and drivers of your presence, especially when riding in low light. It is important to have this sort of warning or signal facing both forwards and backwards, so traffic from either way can see you travelling on the roadway. Reflective material can be a part of your clothing, or something additional to your bicycle, and is designed to catch the light off of vehicle headlights. If you plan on riding long distances or at night, then you will want to have lights on your bicycle and potentially yourself as the most effective means of being seen. Lights are an important piece of safety equipment if you ride at night, or go on long distances rides that may go longer than expected. There are many varieties of lights that will work to improve your safety while cycling, and can attach to your bicycle itself or your body. Active, or blinking, lights typically identify a bicycle as separate from other vehicles on the road. Newer products are being developed that can provide lighting signals from cyclists similar to those of a vehicle, such are left or right turning signals. Depending on the style of cycling you intend to do, and the type of terrain you plan to ride on, you can utilise flags that will attach to your cycle and increase your visibility, especially on busy roadways. There can be downsides to attaching an item that creates drag to your bicycle, and if you plan on racing a flag may not be an appropriate option. If you do choose to attach a flag to your bicycle, consider a bright col or or reflective material for the fabric as it will increase your visibility the most. Mirrors that assist you in seeing to the side or behind you, similar to those of an actual vehicle, will help you be aware of the presence of other cars or vehicles with which you are sharing the road. There are a variety of mirrors available, and can be attached to your helmet or your handlebars. Since one of the most valuable tools for staying safe on the road is your own brain, using mirrors to help keep you fully aware of your surroundings at all times. It is important to think and plan ahead, and assume that danger could lurk around any corner, and having the assistance of viewing what’s behind and to the side of you can be very useful. One commonly overlooked part of equipment that contributes significantly to your safety while riding is the bicycle tire. Tires come in a variety of treads and models, which are designed to manage different types of terrain and conditions. If you will be riding in wet or slippery conditions, a stiff tire with tread not designed for those conditions, could place you at greater risk for a fall or accident. The safety equipment you use while cycling lessens the chance that an incident will occur, and greatly reduces the chance for serious injury should an accident occurs. Each piece of equipment is specifically designed for a variety of safety concerns, and you should be familiar with what is available and how to best utilise it.